After the success of its debut last year, the VR social platform looks to tap deeper into the live events market. Linden Lab has just announced a host of new collaborations designed to attract paying punters to its live events platform which launched last year. These live performances include a partnership with SF Sketchfest, San Francisco’s nationally recognized comedy festival which is now in its 18th year. The festival has grown extensively over the years – showcasing not only local talent and up-and-coming groups, but nationally-known comedians as well – and remains a favorite among audiences, critics, and performers alike. 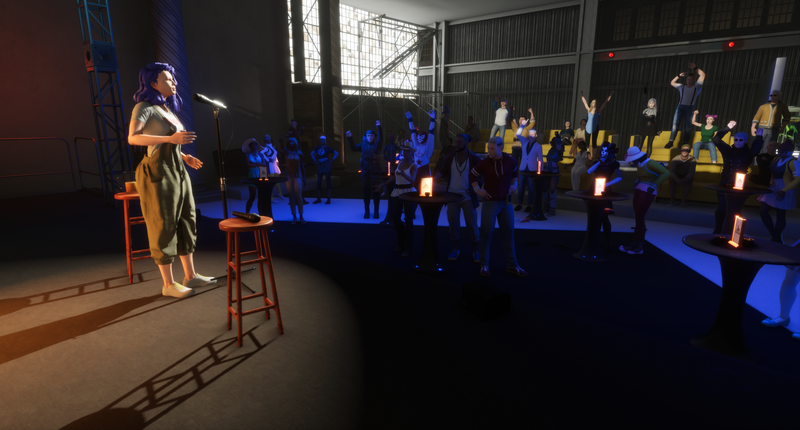 Earlier this month, fans were able to watch a show in Sansar headlined by David Cross (Arrested Development, Mr. Show) and Arden Myrin (Inside Amy Schumer, Insatiable), which drew attendees from around the globe. Tickets are now on sale for the second of two Sketchfest events hosted within Sansar: a show headlined by Michael Ian Black (The State, Wet Hot American Summer, and more) and Andy Kindler (The Late Show with David Letterman, Everybody Loves Raymond, Bob’s Burgers), with additional support from comedian and filmmaker Emily Catalano. The fun goes down Saturday, January 26, at 1 PM PST. Indeed, this follows Sansar’s ongoing strategy to monetize the platform by attracting premium content; and offering top performers a way to reach and connect with broader, new audiences (and consequently new revenue streams) seems like a smart way to go about it. “The live events market is a $100B opportunity, and social VR is in a prime position to capitalize on it by enabling immersive events with unlimited geography, infinite attendance, and limitless self expression for fans. Sansar has put in motion a long-term strategy allowing everyone from talent to event entities to start exploring this innovative business opportunity,” says Sheri Bryant, VP Business Development & Marketing at Linden Lab. In December, Sansar worked with comedian and YouTube personality Steve Hofstetter to launch Comedy Gladiators – a virtual event series featuring stand-up and storytelling from an ever-changing roster of talents, where comedians could also sell custom (virtual) merchandise and reach a global audience simultaneously. The inaugural event featured performances from Ben Gleib, Maz Jobrani, Alonzo Bodden, and Mary-Lynn Rajskub and will return next month with a new run of shows, starting on February 11th with a performance headlined by Steve and featuring stand-up from Josh Wolf, Jamie Kennedy, Zainab Johnson, and Greg Fitzsimmons. “Our first comedy series has drawn attendees from more than 70 cities worldwide, sold hundreds of tickets, and and we couldn’t be more excited to embark on this journey,” says Bryant. Hofstetter adds that the feedback from both the audience and the performers was overwhelmingly positive, so that he’s keen to continue to explore the medium as an outlet for live performances. All fans need is a PC to join, but of course, in order to get the full immersive experience, a VR headset is highly recommended. Tickets for SF Sketchfest Presents: Michael Ian Black + Andy Kindler in Sansar, and to Sansar’s next Comedy Gladiators event, are available for purchase now for $4.99 (early bird pricing).